I am serving as a UN Volunteer Specialist in Democracy, Civil Society and Public Administration in the UN WOMEN Ecuador country office. This gives me the opportunity to work on very important and politically sensitive issues in a country that is undergoing an impressive process of change in terms of gender equality. In addition, every week I give a yoga class to to women refugees that have fled their homes due to gender-based violence, and are now in the local women's shelter. Supporting women in recovery is rewarding and humbling. Quito, Ecuador: Women in all parts of the world suffer violence and discrimination. They are under-represented in political and economic decision-making processes. They lack access to decent work, face gender gaps and are often denied access to basic education and health care. UN WOMEN is trying to address these global challenges. 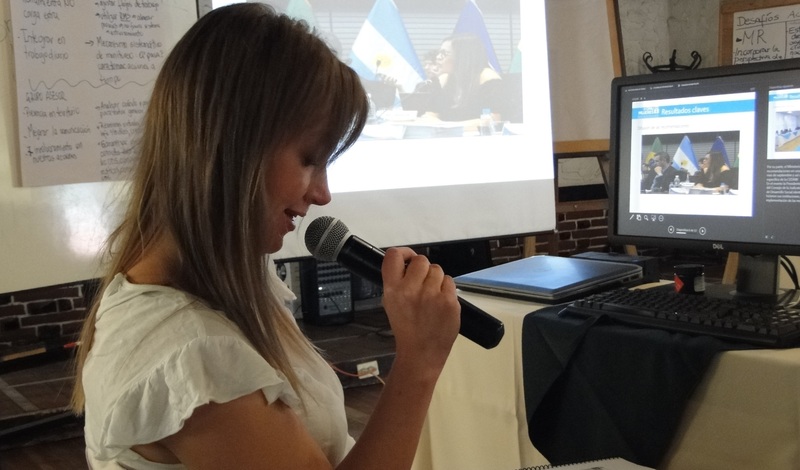 I am serving as a UN Volunteer Specialist in Democracy, Civil Society and Public Administration in the UN WOMEN country office in Quito, Ecuador, where I work in the area of women's leadership and political participation. Serving as a UNV Specialist in Ecuador gives me the opportunity to work on very important and politically sensitive issues in a country that is undergoing an impressive process of change in terms of gender equality. The work touches on very important and often controversial issues that are at the basis of the way societies are organized. In the country office, I am the focal point for the Convention on the Elimination of All Forms of Discrimination against Women (CEDAW). CEDAW is the most important international women's rights treaty worldwide. I am monitoring CEDAW implementation in Ecuador, as well as providing technical assistance to the Ministry of Justice on CEDAW. One of the best experiences so far has been the launch of the interinstitutional mechanism to implement and follow-up on the recommendations of the CEDAW Committee in December 2015. Ecuador is the first country to launch such a mechanism in the Latin America region involving all five branches of government. The launch was the result of a participative process supported by the UN WOMEN country office. The political support the mechanism is receiving is promising. I am proud to get first-hand experience working on this process. In addition, serving as UN Volunteer gives me the possibility to work with the community. Every week, I give a yoga class to gender-based violence (GBV) refugees in the local women's shelter. Supporting women in recovery is rewarding and humbling. Working with the community also provides a balance to the technical work in the office. I believe that the biggest challenge for achieving gender equality are gender stereotypes. Also, men and boys need to be allies for gender equality. There is a lot of work that remains to be done, but I am glad to be able to continue supporting women's empowerment and gender equality in Ecuador thanks to the United Nations Volunteers (UNV) programme. Bio: Jasmin Blessing (Germany) holds a Masters degree in Human Rights from the National University of Ireland and a BA Honours Degree in Latin American Studies from Portsmouth University in England. She has previously worked on women´s rights for UN WOMEN (previously UN-INSTRAW) both in Santo Domingo in the Dominican Republic and in the United Nations Office for the High Commissioner for Human Rights (OHCHR) in New York. She is currently serving as UNV international Specialist in Democracy, Civil Society and Public Administration in the UN WOMEN Country Office in Quito, Ecuador.